I open up registration for a Valentine's Day swap. Wouldn't it be wonderful to receive a "heart" with your initial on it from a blogging friend... new or old... in time for Valentines Day? You then get to EnJoy it for the rest of the year. The "heart" can be any size & design but it must have your partners initial on it. It must be your gift or attached to your gift. 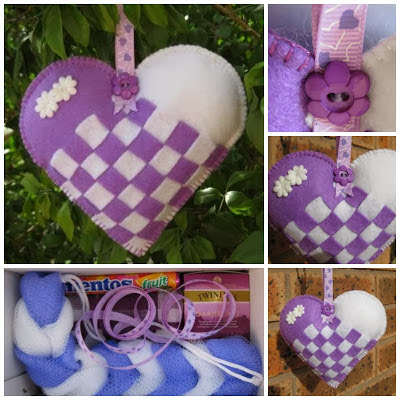 The heart / gift can be made using fabric... quilted, pieced, applique, embroidered... or it can be knitted, crochet or made from wood etc. It's up to YOU! Of course Valentines Day just wouldn't be complete without some chocolate, sweets or nuts... so add a little treat for your SeCReT partner. Registration closes on December 31st... and you can leave a comment on the "December post" or email me directly to join. Please make sure I can contact you & I will need your postal address, blog & email address if you are new to me. Please let me know if you have an allergy to nuts etc... so I can pass that info on. I will email your SeCReT partners details to you in early January...that way you will have as much time as possible to make your special "heart". Ssshh... keep her name to yourself & you may OR may not be receiving from the same person you send to...gotta keep you guessing... & I'll keep partners in the same country where possible. RULES: * You must send a "heart" with your secret partners initial on it. * It MUST be mailed BY FEBRUARY 1st... (please... NO LATER). * Include some chocolate / sweet for her as well. 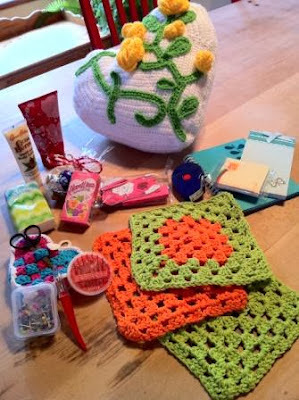 For some ideas... please see some of the gifts sent in previous swaps... just below. IN 2012... we had 43 swappers. IN 2013... we had 44 swappers. IN 2014... we had 61 swappers. IN 2015... we had 41 swappers. IN 2017... we had 20 swappers. You will NOT be able to leave a comment on this page.